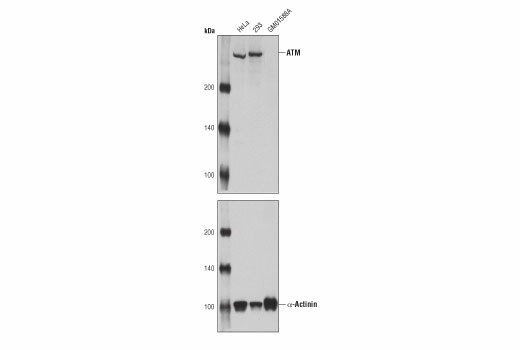 Western blot analysis of extract from HeLa, 293, and GM01588A (ATM-negative) cells using ATM (11G12) Mouse mAb (upper) or α-Actinin (D6F6) Rabbit mAb #6487 (lower). ATM (11G12) Mouse mAb recognizes endogenous levels of total ATM protein. Monoclonal antibody is produced by immunizing animals with recombinant protein corresponding to amino acids 992-1144 of human ATM protein.